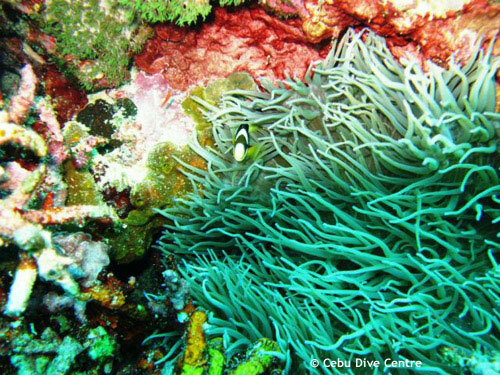 The House Reef is one of the easiest and quickest ways of getting into the water spotting phenomenal underwater creatures. The house reef drops from 3m down to 40m. To make a dive at our house reef, just grab your buddy, don your dive equipment, spit in your mask and off you go. Diving has never been easier! You can dive our house reef anytime, day and night (after your initial environmental orientation dive, of course). Since 1999 a big school of travelly has made our house reef their home, counting thousands and thousands of them, often accompanied by hunting mackerels and tunas. Since the year 2000 more and more whale shark sightings are reported in Moalboal, many of them at the house reef. Panagsama Beach is an excellent dive for beginners and for the divers who love small things. You start the dive at 15 meters and slowly ascent to 10 meters. The chances of seeing a school of sardines being chased by tuna fish is high. There is always a chance that a whale shark will pass by.